Our ‘Vanilla Truffle'™ Proven Winners® Combination is a very striking combo. 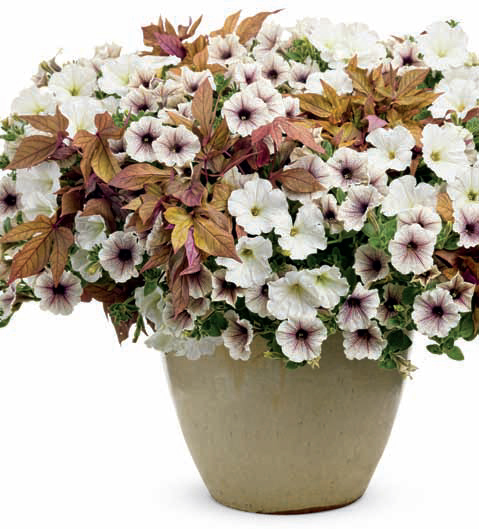 Using the Illusion™ Garnet Lace Ipomea, or Sweet Potato vine, as the background and filler for your container or bed, the Supertunias® White and White Russian add bold contrast and never ending blossoms! 1 combo to fill a container up to 10-inches in diameter. The plants in our 'Vanilla Truffle' plants are grown and shipped in fine quality growing medium and are guaranteed to arrive alive and ready to thrive.